We all know that proper maintenance of your rifle is not an option, but a life saving critical task that must be performed and performed correctly. One of the more difficult things to do is to be able to keep your rifle maintained and ready for use while deployed in the field or away from the confines of your normal cleaning station. 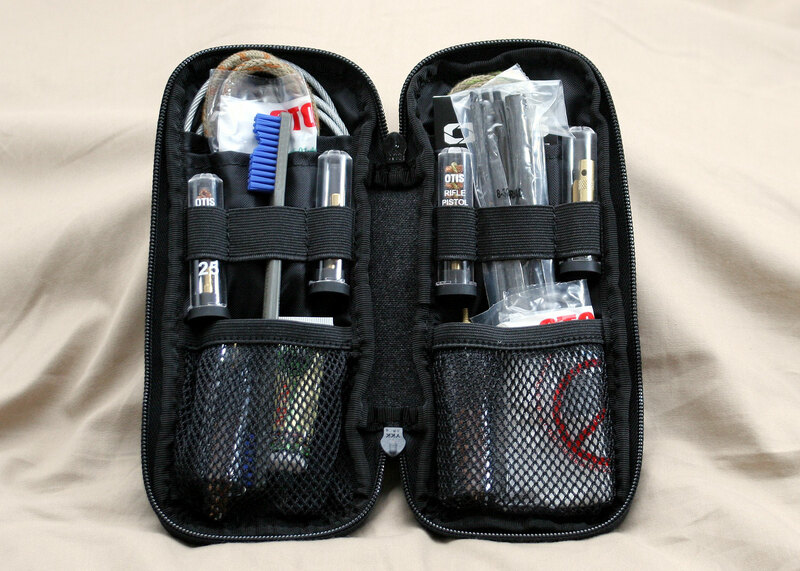 Otis has been a long time supplier of pull through style small tactical cleaning kits that are designed for use both in the field and while in the Armory and we have used many of them through out the years. We thought we would take a few minutes and put together a more detailed look into two of the more common Otis deployment kits that find their way into the kits of snipers. The most common Otis kit that is utilized due to its compact size, and the one most people are familiar with, is the Tactical Cleaning System seen above. This is the one that has become standard issue in the US Military and used by thousands of soldiers around the world. The one we have here for evaluation is the FG-750 BX and is about the rough diameter of a hockey puck, though it is taller. The whole kit completely loaded and ready for use only weighs 13.2oz (0.83 lbs) according to our scales. 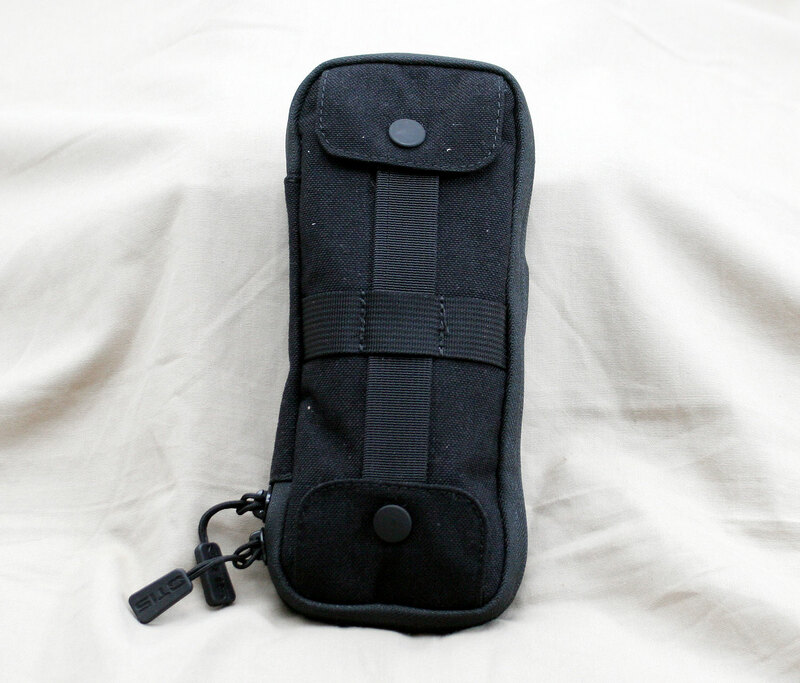 The case is made with a very heavy and durable canvas material with a large nylon zipper. On the back side of the carrying case is a loop for attaching it to a belt or ruck or other load bearing kit and the military ones typically will come in FDE (Tan) with two attachment hooks to make it even more convenient to attach them. Normally though, they just get thrown inside the ruck and pulled out when needed. When the case is opened up the contents are broken down into two separate levels within the case. On the top level are all the cable tips, thread connector, tube of CLP cleaning and lubrication solvent, chamber brush and other small items. When the middle divider is raised you will find all of the bore brushes, patches, pull through cables. There is even a bright orange chamber flag to indicate to your buddies that the rifle is cleared and safe. Not only is the chamber flag handy, but it is also a “bore reflector” and with the use of a flash light it acts as a bore light to be able to check on the bore and rifling condition and cleaning. It is a tight and handy little package that has everything you need to perform your practical maintenance while in the field. In fact, when you pull it all out and display it, it looks impressive with everything that gets packed inside the case. 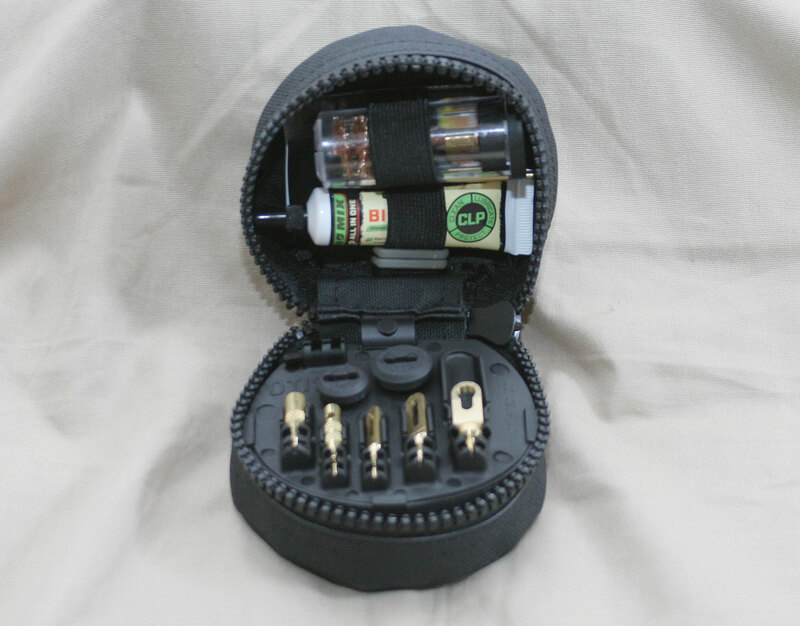 This particular kit includes tips and brushes for any rifle or pistol (notice the small cable) from calibers .17 to .50 and for any shotguns with gauges .410 to 12. That is a huge variety of firearms that this kit can handle and of course, if the kit is only going to be used for a single rifle, some items can be discarded to save weight and to make room for other items such as more patches. Otis does make more specific kits designed for a reduced number of firearms as well. Notice there is even a small T-handle that is used to aid with pulling the cable through the bore, and of course, there is a small booklet of instructions. Those instructions illustrate the proper way to use their Otis specific cleaning patches that can be used for all the different calibers and gauges. This is one of the helpful keys for the kits flexibility, though of course that means you have to purchase their specific patches which are available separately. As is obvious, the kit itself utilizes a “pull through” system designed to only go from breech to bore, which is always the preferred direction to send the cleaning patches and brushed through a bore. Beyond figuring out the proper way to utilize and fold the patches, using the kit is straight forward. The small instruction booklet provides the directions on how to use the patches based on the caliber of the barrel and it takes some practice but otherwise is straightforward. Actually using the kit in the field is certainly slower than a typical cleaning rod and patches and it takes a concerted effort to do it properly. But the system works very well and it is very convenient to just throw the “hockey puck” into the ruck and move out. 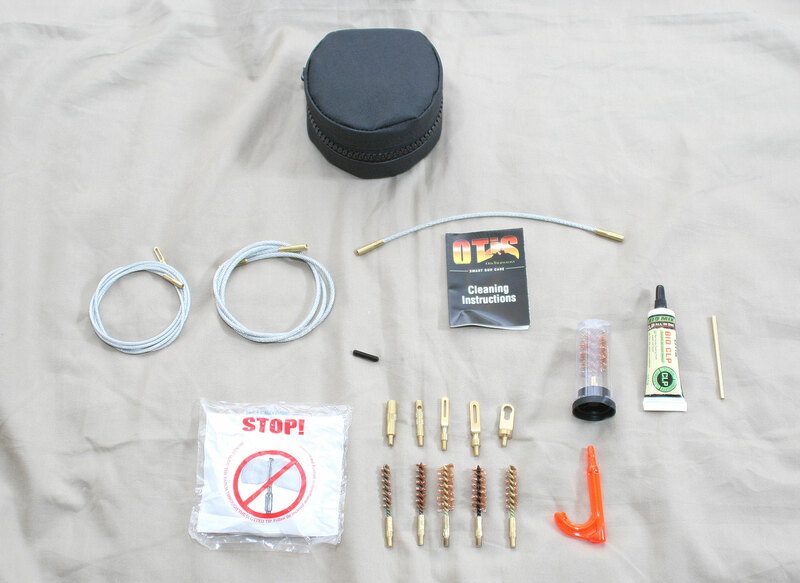 The wide variety of tips also includes handy tips to help with barrel obstruction removal, which can also be used to extract stuck brass using the cable coming down from the muzzle. The cable system combined with brass tips will not harm the rifling of the barrel and as a whole the kit may be slower, but it is effective and a must have for deployments. We typically have a Otis kit on hand when teaching classes and have used them for a number of things beyond just cleaning a rifle including removing stuck brass from student’s rifles. Of course, we have also used them extensively during training and deployments with good success. The cost is about $60 which isn’t too bad and their replacement patches run about $10. The way they have you use the patches they indicate you can use them two or three times, but we’ll leave that decision to your discretion. All in all, they are pretty darn handy and good to have on hand even if just going hunting for a day. 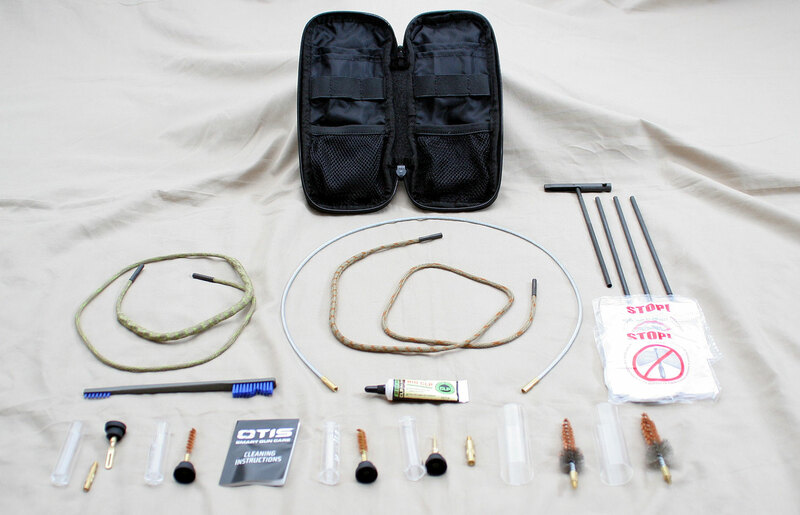 The Otis Tactical Cleaning System as reviewed above is certainly the more widely known and utilized Otis kit on the market. But there is another kit that we like to use as well. This one is known as the Defender Series kit. It is a bit larger than the hockey puck styled Tactical Cleaning System, but with that extra size and weight comes some additional tools and supplies for maintaining your weapon in the field or away from home. The weight of this kit comes in at 1.04 lbs, so just a couple of ounces heavier than the smaller kit. The canvas case has some snap pockets to allow for some of your own additional items to be added and carried along with the kit as well. The defender kit is tailored specifically for the military and only has equipment for taking care of 5.56 (223 Rem) and 7.62 (308 Win) rifles, which can also include 300 Win Mag. When you open the rectangular shaped kit you are greeted with a full complement of items. 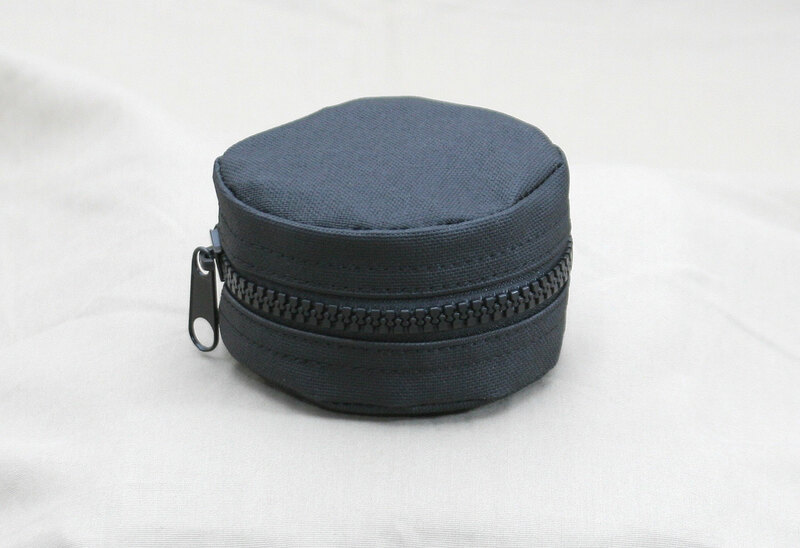 Because the case is larger it allows for some additional items to be included aside from just the standard pull through cable, patches, and brushes. The kit comes with a nylon cleaning “tooth” brush and even a multipiece solid cleaning rod with a folding T-Handle on it, the same type that is included in the field cleaning kits for M16 rifles in the military. Of course there are the pull cables, various tips, cleaning solvent, patches and other items which you can see in the picture below. The Defender series also includes two semi-stiff pull through cleaning cables that are similar in concept to the popular ‘Bore Snakes’, as well as the normal cable. 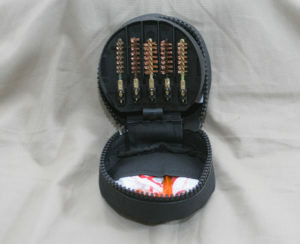 There are two chamber brushes for the two cartridges the kit is designed around and some other bits and pieces. We were surprised to discover that there was no brass T-Bar to be used to help pull the cables through the bore and we all thought that should be included with this kit. In the meantime, it would not be difficult to fabricate one yourself, or grab one from the Otis tactical cleaning system kit. The additional size and items of the defender series kit means it does round about $20 more than the smaller Tactical Cleaning kit. The usage of this kit would be similar to the smaller kits, but you now have more equipment to help provide a more thorough maintenance routine for your rifle. The chamber brush, nylon brush, and pull through cleaning cables are all useful for more detailed cleaning. The multi-piece rigid rod is something we would not recommend using on a precision sniper rifle as each of those joints on the rod provides another potential edge to strike against the rifling of your precision barrel. But those pieces can be used to attach brushes and patches to in order to help provide cleaning access to hard to get places on your rifle and of course the chamber brushes can be attached to them as well. All in all, the kits are both nice and we use both, especially when we are mobile and away from home base. The smaller kit can be useful when in hard deployment environments where you have nothing more than your lighter ruck and out in the field. The larger defender kit makes a nice companion that can be kept with your longer term personal gear. We continue to be impressed with the usefulness of these little kits and will continue to use them. Otis makes a version of that small round kit that is designed like the Defender in that it carries only 5.56mm and .30 cal. It adds a couple useful items for sniper use including the lens brush, but loses some of the extraneous items such as the .17 stuff.